If we think about it, every day, every minute of our life is an inspiration to create something, to record it in our own unique manner. That is how I find inspiration for my compositions, whatever seems to catch my attention that day or minute becomes the subject of my next painting. Art is a beautiful medium to acknowledge, appreciate and admire the life that we have, and I attempt to do so in each inch of the canvas I paint. Irina Rumyantseva hails from the United Kingdom. Her works vary from landscape to cityscape to figurative and various other themes which are created with a spectrum of mixed media forms. 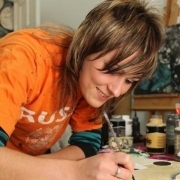 Her works have been well received across the globe and she is also open to doing commissioned pieces.